Today Thursday 30th June, 2016, just few hours ago, Independent National Electoral Commission (INEC) issued Certificate of Return to Samson Ogah following court order that Okezie Ikpeazu should vacate the Office of Governor of Abia. 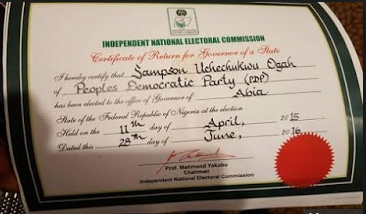 INEC National Commissioner (South East) Lawrence Nwuruku confirmed the issuance of the certificate to Ogah. Amb. Lawrence Nwuruku, who is the INEC National Commissioner in charge of the South East said the commission only kowtowed to the lawful order of a court. He (Nwuruku) also added that “as a citizen, he could go to jail if he flouts a valid court order”. He also said "if the court tomorrow orders a reversal of the action, INEC would not hesitate to do its bidding". Amb. Lawrence Nwuruku statement: “The situation is that we are simply obeying the court order. The court said with immediate effect without wasting of time, we should issue him Certificate of Return and that is what we have done – to obey the court order. If the court tomorrow issues another order, we would obey the same. By the grace of God, I am the INEC Commissioner in charge of South East. I’ll do the same thing if the court orders us to do so. If court says we should issue the same certificate to another person. 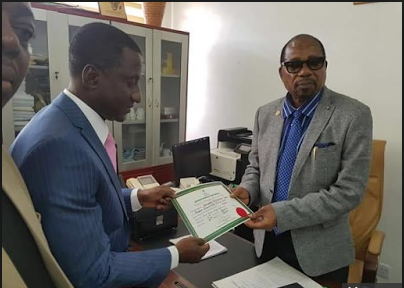 In this case, court ordered us to issue a Certificate of Return to the person who won the election and that is Uche Ogah. I was the person who gave the Certificate of Return to Gov. Ikpeazu as he was declared winner. Now, the court has said otherwise. One thing we know is that we are not above the law and we cannot disobey the laws of the land. After the court, another person we obey in our land is God and my conscience is my God. Another thing that guides us is the court and we must obey its order with immediate effect. If you were in the court that day, and I urge you the media, to go and study the court ruling very well, it was wonderful; it was direct”, he said. Speaking in the same vein, INEC’s Director of Publicity, Oluwole Osaze-Uzi, had earlier stated that the decision followed an order by an Abuja Federal High Court directing INEC to immediately issue Certificate of Return to Mr. Ogah. Justice Okon Abang of the court had Monday asked INEC to issue the Certificate of Return issued to Mr Ogah. Recall that on Monday 27th June, 2016, The Federal High Court Sacks Abia State Governor Okezie Ikpeazu for failing to pay per­sonal income tax promptly as and when due for 2010 and 2011 in line with Section 24(f) of the 1999 Constitution. Justice Abang, had ruled that on the account of fake tax returns during the primaries, Mr Ikpeazu, ab initio was never qualified to run in the PDP primaries as a governorship candidate. He (Justice Abang) consequently ordered the Chief Judge of the state to swear in Uche Ogah as the substantive Governor of Abia State. We hope and believe Mr. Uche Ogah will be more better than Okezie Ikpeazu. 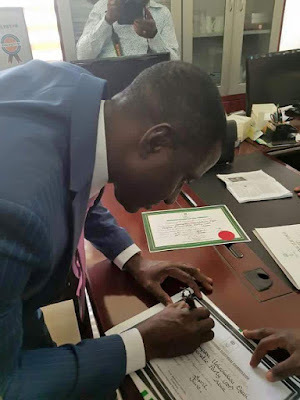 Abia State New Governor, Mr Uche Ogah INEC Certificate of Return.